This illustration features images of southern California and southwestern Nevada acquired on January 3, 2001 (Terra orbit 5569), and includes data from three of MISR's nine cameras. The San Joaquin Valley, which comprises the southern extent of California's Central Valley, covers much of the viewed area. Also visible are several of the Channel Islands near the bottom, and Mono and Walker Lakes, which stand out as darker patches near the top center, especially in the vertical and backward oblique images. Near the lower right of each image is the Los Angeles Basin, with the distinctive chevron shape of the Mojave Desert to its north. The Central Valley is a well-irrigated and richly productive agricultural area situated between the Coast Range and the snow-capped Sierra Nevadas. During the winter, the region is noted for its hazy overcasts and a low, thick ground fog known as the Tule. Owing to the effects of the atmosphere on reflected sunlight, dramatic differences in the MISR images are apparent as the angle of view changes. 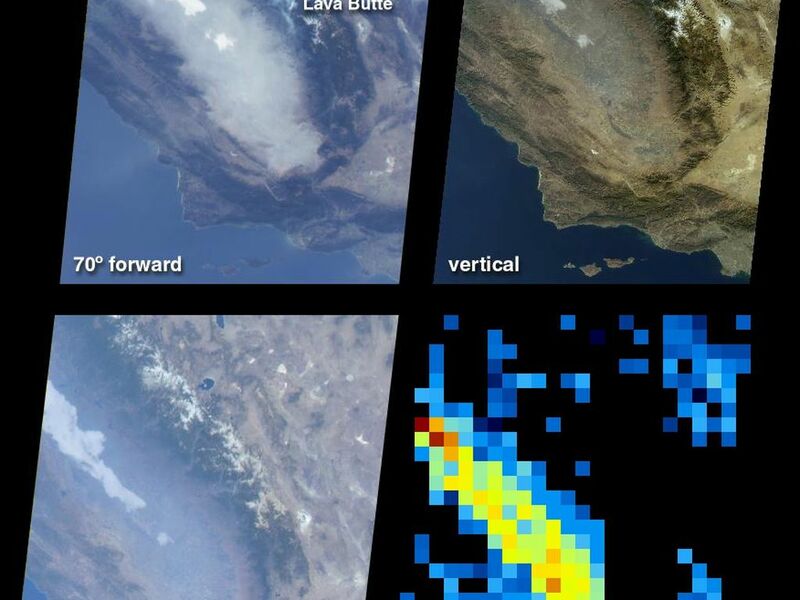 An area of thick, white fog in the San Joaquin Valley is visible in all three of the images. However, the pervasive haze that fills most of the valley is only slightly visible in the vertical view. At the oblique angles, the haze is highly distinguishable against the land surface background, particularly in the forward-viewing direction. 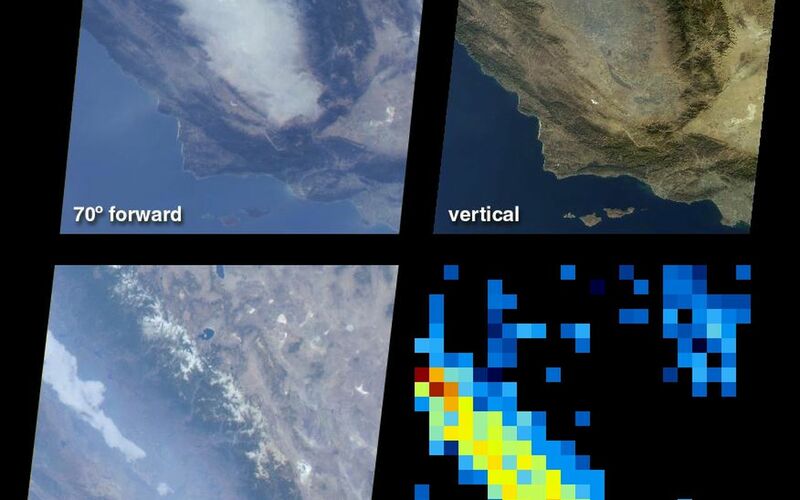 Just above image center, the forward view also reveals bluish-tinged plumes near Lava Butte in Sequoia National Forest, where the National Interagency Coordination Center reported an active forest fire. The changing surface visibility in the multi-angle data allows us to derive the amount of atmospheric haze. 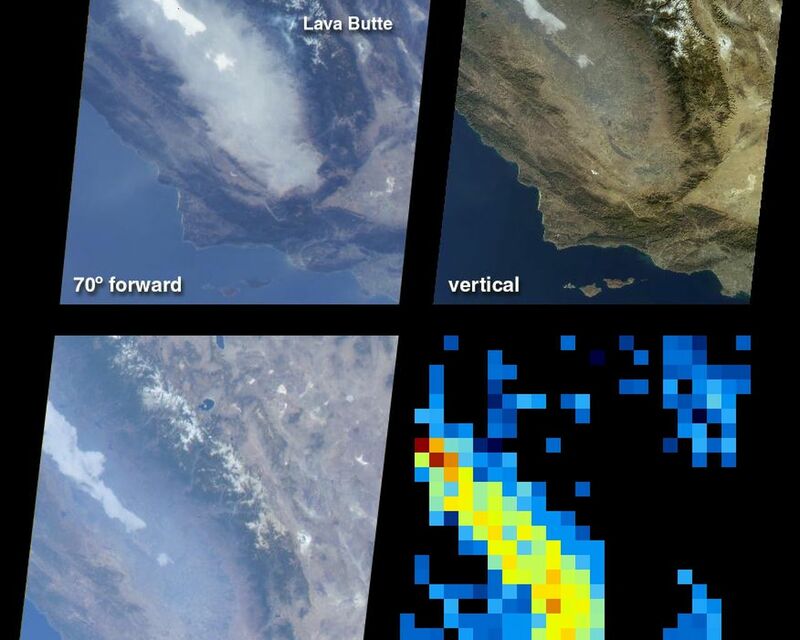 In the lower right quadrant is a map of haze amount determined from automated processing of the MISR imagery. 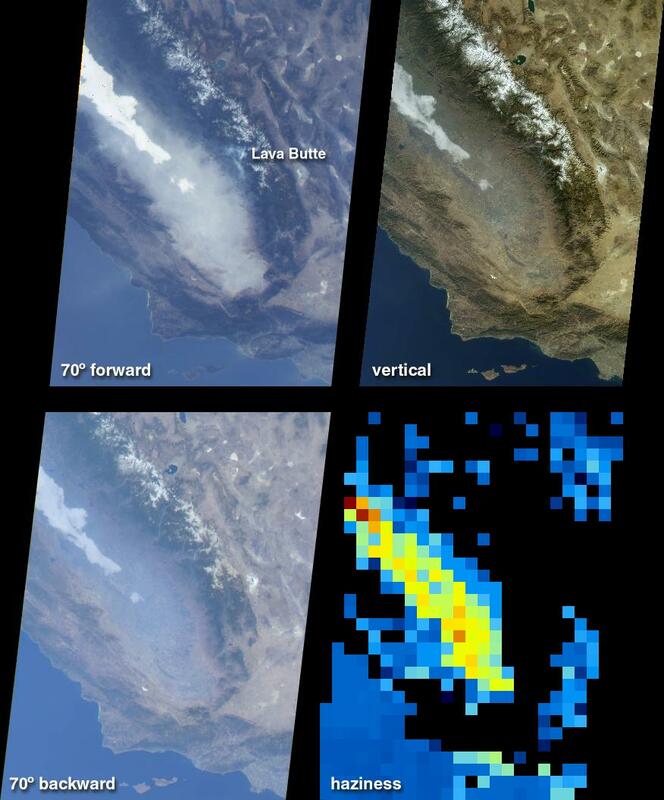 Low amounts of haze are shown in blue, and a variation in hue through shades of green, yellow, and red indicates progressively larger amounts of airborne particulates. Due to the topographically complex terrain, no results are obtained over the Sierra Nevada and Coastal mountains and these areas are shown in black. However, the enhanced haziness of the San Joaquin Valley is evident in this derived product. Within the yellow pixels, the Sun would look about 40% dimmer to an observer on the ground in comparison to its brightness on a much clearer day.